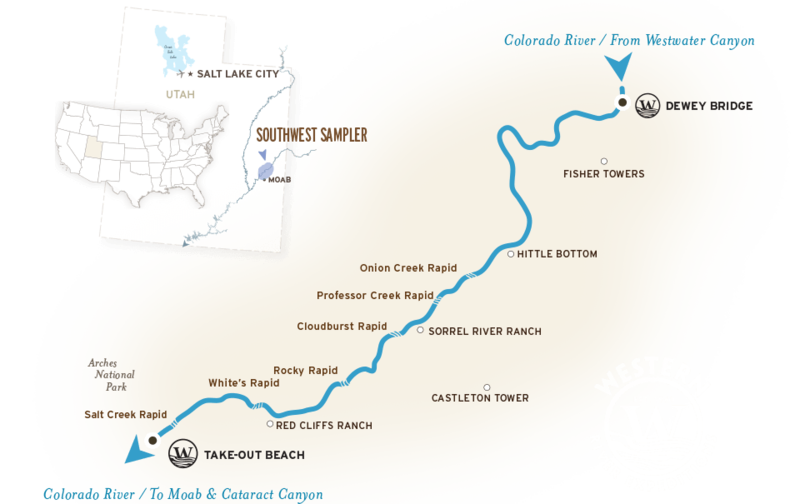 The Colorado River portion of your Moab, Utah Vacation Sampler, begins east of Moab through Castle Valley. Award-winning Highway 12 escorts you up the canyon along the Colorado River to your put-in at Dewey Bridge. The views of the LaSal Mountains and Fisher Towers to the south will astound you along the calmer stretch of river as you begin your float. Soon you'll find rapids as you reach the top end of Castle Valley. Camp is somewhere near Onion Creek, allowing time to soak in the sunset, some great food and chatter. Enjoy the star show intermission... In the morning, you'll encounter several more rapids as you reach the bottom end of the valley and approach "Take-Out Beach".